In a rapidly changing labour market where many low- and middle-skilled jobs are disappearing, enhancing job opportunities through higher education has become a major policy objective. In particular, the US Department of Education has recently focused efforts on helping college students use labour market information to choose colleges and majors by creating the College Scorecard website (collegescorecard.ed.gov). The concern about the labour market outcomes of various college degrees is arguably more pressing for students from disadvantaged backgrounds, whose parents are more likely to be adversely affected by the decline in low- and middle-skilled jobs. These disadvantaged students are concentrated in public two-year community colleges, which represent over 40% of total undergraduate enrolment in the US (Bailey et al. 2005, Ma and Baum 2015). In community colleges, the salary earned after graduating with different degrees varies dramatically (e.g. Jepsen et al. 2014). Switching from a humanities Associate of Arts (AA) to a vocational AA would entail a gain of more than $1,000 in quarterly earnings, and a switch from a humanities AA to a health AA would yield a gain of about $4,000. In new work, we examine whether students are aware of these differences and how much beliefs about labour market outcomes influence major choice (Baker et al. 2017). We surveyed students in two community colleges in California in the winter of 2014. We asked them to provide guesses about the salary and employment status of alumni from their own college. We also collected the actual answers to these questions using administrative data from the California Employment Development Department (EDD) Labor Market Information Division. We found that students only have a vague idea about alumni salaries by broad major (Figure 1). On average, a student’s guesses about average salary are off by 40% (both over- and under-estimates). Only 16% of students correctly rank four broad majors (science/maths/engineering, business/computer science, arts/language, humanities/social sciences) by salary. We also asked students about the probability that alumni with different broad majors have a job. This was not any better known than salaries – the average student either over or under estimates the probability of employment by 38%. Students are misinformed about both the salary and employment status of alumni from their own college. Therefore, they likely cannot make informed major choices when it comes to picking a major with good labour market prospects. But do students even care about labour market prospects when choosing a major? We asked students what majors they are likely to choose, and find that their beliefs about alumni salary are related to their major choice. Students are more likely to choose broad majors with a higher salary. We then ran an experiment where we presented students with different scenarios regarding salary, such as: “If alumni salaries in business, computer science, and technology were $30,000, how likely would they be to pick this major?” Overall, we found that a 1% increase in salary increases the probability of choosing a major by about 1.5%. The probability of having a job is not as important when picking a major. We found that a 1% increase in the probability of employment only increases the probability of choosing a broad major by about 0.4%, and this increase is often not statistically significant. While students are more likely to pick a major with a high salary for alumni, remember that students are quite misinformed about alumni salaries. In fact, we find that students who are less well informed about alumni salaries put less weight on this aspect when choosing a major. This suggests that students know that they are misinformed and may rationally put less weight on something that they feel very uncertain about. Salary clearly matters when picking a major, but community college students also take into account other factors. In fact, the most important determinant of major choice is students’ beliefs about how much they will enjoy the courses. 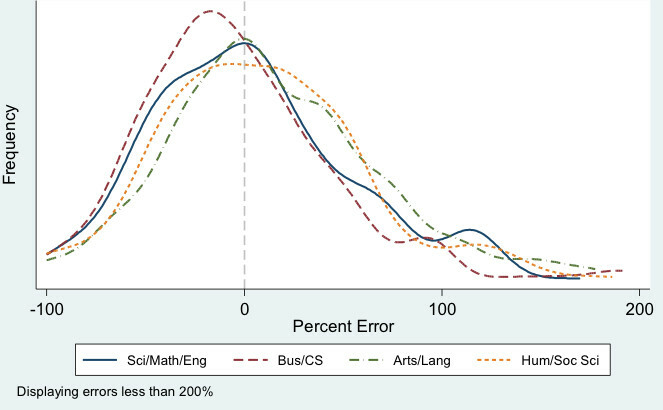 A 1% improvement in course enjoyment leads to about a 0.8% greater chance of picking a major. Quantitatively, the effect is not very different from the effect of salary, but differences in beliefs about course enjoyment can predict major choice much better than differences in beliefs about alumni salary. Grades are almost as important as course enjoyment when picking a major, and are important predictors of students’ choice. To explain students’ major choices, enjoyment and grades are the most useful. Salary also matters, but to a lesser extent, perhaps because students are uncertain and therefore put less weight on salary. Many degrees in community colleges are short and geared towards the labour market. Despite this, community college students are similar to the typically more advantaged four-year college students, who also put a lot of weight on non-monetary factors when choosing a major (Beffy et al. 2012, Wiswall and Zafar 2015, Stinebrickner and Stinebrickner 2014). Different majors in community college lead to vastly different outcomes in terms of salary. Yet, students know little about these differences, even though much of the information is available on the internet (for example, through a site called Salary Surfer in California). The mere existence of information is not enough to ensure that students know about the labour market outcomes associated with different majors. Current methods of providing information do not necessarily allow students to reliably improve their opportunities in the labour market. Our findings suggest that to improve labour market outcomes, one should consider offering students labour market information at crucial junctures of the major-choosing decision. Furthermore, since course enjoyment and grades are the most important determinants of major choice, it may be ill-advised to focus on informing students about the highest paying majors. Instead, one could offer labour market information about majors that students already like, and where they think they will be getting good grades. Such timely and relevant provision of information has the potential to improve labour market opportunities for community college students. Bailey, T R, D Jenkins, and TLeinbach (2005), “What we know about community college low‐income and minority student outcomes: Descriptive statistics from national surveys”, Teachers College Community College Research Center, New York. Baker, R, E Bettinger, B Jacob, and I Marinescu (2017), “The Effect of Labor Market Information on Community College Students' Major Choice”, NBER working paper 23333. Beffy, M, D Fougère, and A Maurel (2012), “Choosing the field of study in postsecondary education: Do expected earnings matter?”, Review of Economics and Statistics, 94 (1): 334–347. Jepsen, C, K Troske, and P Coomes (2014), “The labor-market returns to community college degrees, diplomas, and certificates”, Journal of Labor Economics, 32 (1): 95-121. Ma, J, and S Baum (2015), Trends in Community Colleges: Enrollment, Prices, Student Debt, and Completion, New York: The College Board. Stinebrickner, T R, and R Stinebrickner (2014), “Academic Performance and College Dropout: Using Longitudinal Expectations Data to Estimate a Learning Model”, Journal of Labor Economics, 32 (3): 601 – 644. Wiswall, M, and B Zafar (2015a), “How do college students respond to public information about earnings?”, Journal of Human Capital, 9 (2): 117-169. Wiswall, M, and B Zafar (2015b), “Determinants of college major choice: Identification using an information experiment”, Review of Economic Studies, 82 (2): 791-824.